Steven (Chicagoland, United States) on 2 December 2014 in Architecture and Portfolio. Drawn by its beauty and the fabulous free public events, hundreds of thousands of visitors come to the Chicago Cultural Center every year, making it one of the most visited attractions in Chicago. The stunning landmark building is home to two magnificent stained-glass domes (that I captured HERE and HERE) as well as free music, dance and theater events, films, lectures, art exhibitions and family events. Photo captured September 13, 2014. Excellent point of view and interesting history. The stained-glass domes are magnificent as well. Wonderful shot of the cityscape. Beautiful architecture. That building looks very well built and in an appealing style. Very good picture. Very beautiful framing of this superb building ! Great description for a great image. The light is superb. striking architecture amidst the contemporary steel and glass towers! interesting info, as always ! Interesting description of the place. I like the reflections in the numerous windows. The architectural contrast against the buildings of the background is just fabulous ... Excellent shot and great information !!! A beautiful image of this grand old building. They don't build them like this any more. What a gorgeous building! The Tiffany dome sounds amazing. The architecture is just beautiful! I also like the reflection in the windows! A beautiful building. I love those arched windows. I love this building. 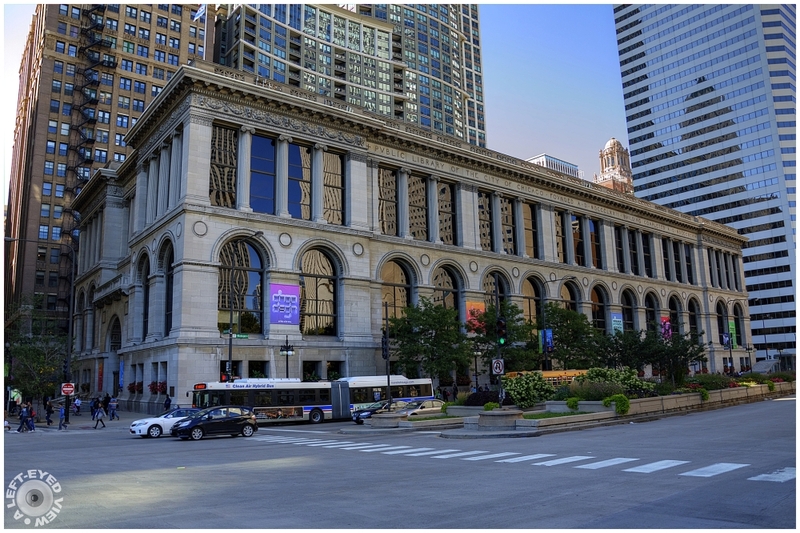 I took my teenage daughter downtown in the early 1990s, mostly to see Marshall Fields and Water Tower and we stumbled into the building that I remembered as the old public library. It was run-down but awesomely beautiful. I believe that they had just decided not to tear it down, but were unsure where they would get the money to restore it. Even my teen was aghast that they would consider tearing it down, but of course it all comes down to money. I am so glad to see it restored and the Bean, etc. built to make that part of Chicago a destination.